One herbal drink that has slowly gained popularity and has now become an integral part of every individual’s daily diet is the green tea. 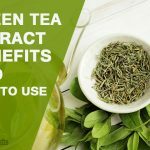 Though green tea has been around since ages, it is only now that it has become popular with a lot of health gurus and beauty experts emphasizing its benefits. One of the most popular belief is that green tea helps in weight loss and you will often find people skipping their favorite cup of tea/coffee in favor of a cup of green tea. You will also find numerous beauty blogs that will tell you how to use green tea and green tea bags in various beauty recipes. With a plethora of benefits, it is no wonder that green tea has become a popular drink with everyone. However, it would be wrong to focus only on the benefits of green tea. With so many positive uses, people often tend to overlook the side effects of green tea. 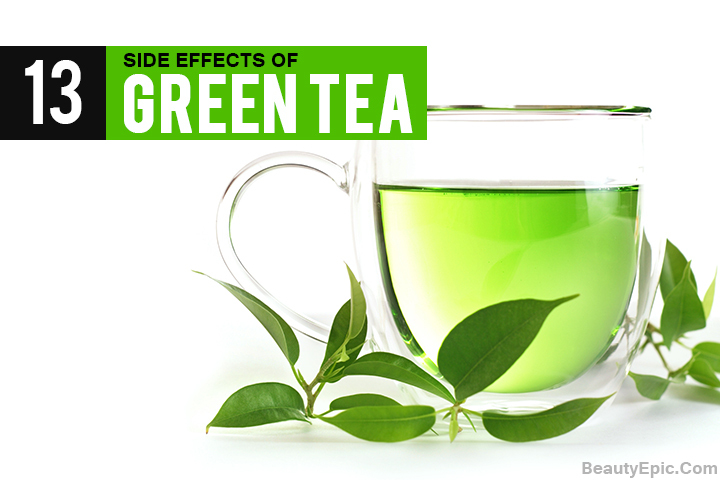 Read on to know the various side effects of green tea. If you are a green tea fanatic, then you need to be aware of these 13 side effects. Just like the other teas, green tea also contains caffeine. When there is over-consumption of green tea, the caffeine in it can lead to irritable bowel syndrome and also increase the risk of diarrhea. In order to keep your bones healthy and strong, your body needs sufficient calcium. When you drink green tea, the mount of calcium that gets flushed out of your body through urine increases. This is one of the reasons why you need to monitor the levels of your green tea consumption. Excessive bleeding can occur within and outside your body because of a bleeding disorder. The clotting of blood gets affected due to this disorder. If you are suffering from a bleeding disorder, then drinking green tea can aggravate it further. 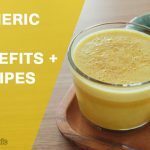 There have been reports which have stated that green tea extracts or supplements that have green tea extract are harmful for your liver. 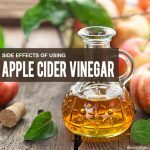 It can also worsen your condition if you are already suffering from some kind of liver disease. Most of the side effects of green tea is due to the caffeine content. Another side effect is that drinking large quantity of green tea can result in various heart conditions like irregular heartbeat. So keep your heart healthy and safe by limiting your intake of green tea. Glaucoma is a condition which affects your eyes. Drinking green tea has known to cause glaucoma by increasing the pressure inside your eyes. The increase in pressure usually starts within 30 minutes and can last up to 90 minutes. Drinking green tea if you are suffering from an anxiety disorder should definitely be avoided as it can result in an increase in your anxiety levels. Though people suffering from diabetes don’t have to completely cut off the intake of green tea, they have to make sure that they are monitoring their blood sugar levels carefully. This is because your blood sugar can be affected due to the presence of caffeine found in green tea. There are three substances namely tannic acids, caffeine and catechins which are deemed risky for pregnant women. All three substances are found in green tea. Hence, it is very essential that pregnant women should keep their green tea consumption to a minimum. It has been observed that over-consumption can also lead to miscarriages. It is best to avoid it during breastfeeding as well as it can lead to neural tube defect in babies. This is because the caffeine can pass through the breast milk and cause harm to the baby. Do not consume green tea on empty stomach as it can lead to various problems like stomach aces , constipation, etc. 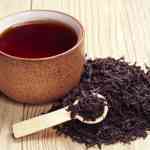 This happens because of the tannins present in the green tea which stimulate the acids present in your stomach. The gastric acids can also be stimulated, hence you should always drink green tea between meals. Acid reflux and peptic ulcers are two other conditions when people should avoid drinking green tea. Lack of sufficient hemoglobin in your body leads to anemia. So if you are already an anemic patient, then make sure not to consume excess green tea as the catechins in it can affect the absorption of iron from the food that you consume. What you could do is make sure that you eat food that is rich in iron and vitamin C such as red meat, lemons, etc. 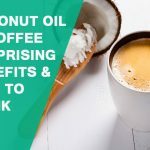 As we all know excess caffeine can wreak havoc in our systems leading to unwanted nervousness, shakiness, abnormal heart beats, etc. These side effects come in the foreground depending upon your tolerance level for caffeine. People who have a high tolerance level may not necessarily face these symptoms however those who have a low tolerance level will definitely go through these symptoms if they take more than 1-2 cups of green tea daily. If you think that because of its numerous benefits green tea can be consumed by children as well then you are completely wrong. This is one herbal drink which is a strict no-no for children. The caffeine and tannins can do more harm than good for children. Over stimulation, lack of proper nutrients, fats and proteins absorption, are some of the side effects that a child would have to face if he or she consumes green tea. The above mentioned side effects would be encountered only if you are consuming more than 2-3 cups of green tea in a day. We are often told that having anything in excess will only cause problems and that is the same case with green tea. So all you need to do in order to avoid the above symptoms is to closely monitor your green tea consumption levels. Do you know about any other green tea side effects? Do share them with us! Herbal drink that has slowly gained popularity and has now become an integral part of daily diet is the green tea. Know the side effects of green tea.